MORL, MRRL are the highest yielding 2x ETNs, followed by SMHD and CEFL. 3-month LIBOR significantly lower this month, giving a reprieve to 2x ETN expense ratios. LRET is the best-performing 2x ETN over 1 year, with +30% returns. The ETRACS 2x Leveraged ETN Snapshot presents the latest updates on the news, yields, performance and other data for the ETRACS 2x ETNs, an extremely popular suite of high-yielding vehicles for income investors. This consolidated report is designed to help members evaluate at a glance which of the ETNs may deserve a place in their portfolios. 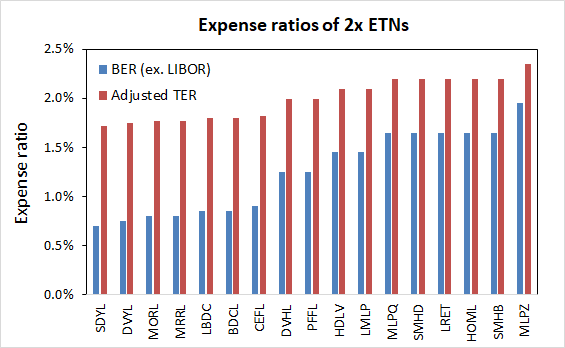 Note: BER = baseline expense ratio (excluding 3-month LIBOR, but including financing spread), TER = total expense ratio (including 3-month LIBOR and financing spread). Adjusted TER = TER/2 (to account for the 200% leverage and to enable comparison with 1x funds). 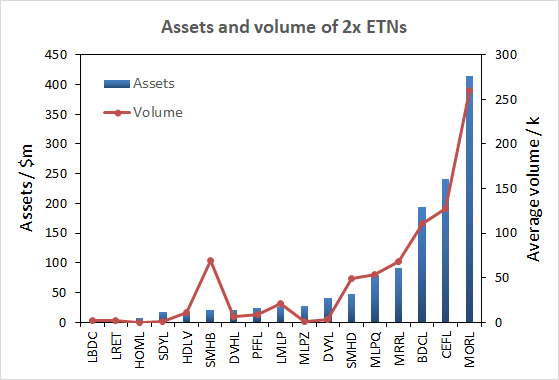 The chart below shows the assets under management and the average volume for all of the 2x ETNs. We can see that MORL is still the largest of the 2x ETNs, followed by CEFL and BDCL. MORL, CEFL and BDCL are also the three most actively-traded ETNs. Note that several of the ETNs are thinly traded. For those illiquid ETNs, it is recommended to use limit orders to ensure that the transaction is executed at an acceptable price. Moreover, it is highly recommended to check the indicative price of an ETN, available on the UBS ETRACS website (e.g. here for CEFL), before buying or selling the low-volume ETNs. This is because financial websites or brokers often quote the last-traded price, which can deviate significantly from the NAV (technically, "indicative value" for the ETNs) for the thinly traded ETNs. 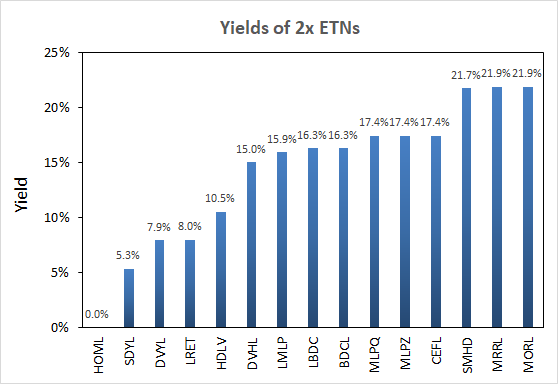 One of the major attractions of the 2x leveraged ETNs is their often mouth-wateringly high yields. The yields (trailing 12 months) of the funds are displayed graphically below, arranged in order of smallest to largest. Note that HOMX is a total return fund, and hence pays zero distributions. MORL, MRRL have the highest yield at 21.9%, followed by SMHD at 21.7% and CEFL at 17.4%. All of the ETNs pay monthly except for BDCL/LBDC, MLPQ and MLPZ which pay quarterly (and except for HOMX which pays no distributions at all). The newly launched SMHB is expected to have a similar yield as SMHD as they track the same index. Also, PFFL's ttm yield will be provided after it completes its 12-month of existence, but it is expected to yield about twice of the unleveraged PFF. Note that MORL may exhibit a slightly lower yield than MRRL even though both ETNs track the same index, due to the suspension of sales of new notes of MORL which may allow MORL to trade at a premium (see "What To Do About MORL?" for more information). The same applies to the SMHD and SHMB, with SMHD possibly experiencing a lower yield for the same reason (see "What To Do About SMHD?" for more information). Investors might be interested in whether or not the 2x ETNs have been able to grow their distributions. The following chart shows the 1-year DGR and 3-year (annualized) DGR for the 2x ETNs, where available. Note that these are calendar year DGRs and therefore only show data where full years are available, for example, the 1-year DGR represents the distribution increase from 2017 to 2018, while the 3-year DGR represents the distribution increase from 2015 to 2018. With another year (2018) under our belt, four more 2x ETNs that were incepted during 2016 now have two full calendar years (2017 and 2018) of distribution history: MLPQ, MLPZ, allowing the calculation of calendar 1-year DGR ratios. Similarly, calendar 3-year DGRs are now available for the ETNs incepted in 2014 since they have now four full calendar years of distribution history available (2015, 2016, 2017, 2018): HDLV, LMLP. We can see from the data below that 3 out of 14 leveraged ETNs have managed to increase their distributions from 2017 to 2018. SDYL showed the largest 1-year DGR increase (+19%), followed by LMLP (+14%) and DVYL (+3%). 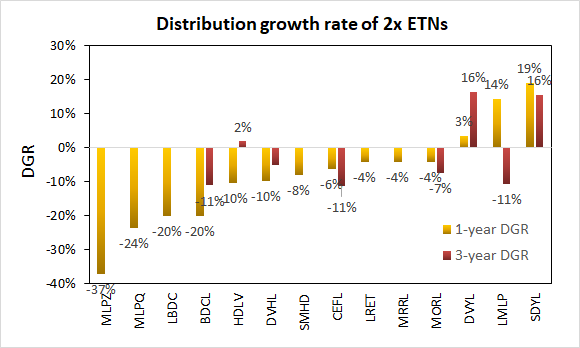 The ETNs with the largest 1-year DGR decreases were MLPZ (-37%), MLPQ (-24%), and BDCL/LBDC (-20%). In terms of 3-year DGR, 3 out of 8 leveraged ETNs for which we have data available managed to increase their distributions from 2015 to 2018. Here, DVYL and SDYL have the highest 3-year DGRs of +16%, while BDCL, CEFL and LMLP have the lowest 3-year DGRs of -11%. It should be remembered that the distributions of the 2x ETNs are not only affected by the yield of the underlying holdings, but also changes in price of the ETNs. This is because the ETNs are 2x leveraged. Hence, increases in the price of the ETNs will boost their distributions, and vice versa. See this Lance Brofman article for a detailed explanation. Regarding the expense ratios, UBS engages in the (rather dubious, in my opinion) practice of hiding their financing spread within their pricing supplement, which makes their headline management fee (known as "tracking rate") look lower. For example, SDYL has an annual tracking rate of 0.30%, a figure that is displayed prominently on the fund's website, but you have to dig into the pricing supplement to see that you are being charged an additional 0.40% in financing spread. This means that the total financing rate will be 0.40% + 3-month LIBOR (currently 2.61%). Adding all three fees together gives a total expense ratio [TER] of 0.30% (tracking rate) + 0.40% (financing spread) + 2.61% (3-month LIBOR) = 3.31%. However, remember that these ETNs are 2x leveraged. Thus, I devised an "adjusted TER" that takes into account both the current LIBOR rate, and the leverage of the fund, which can be achieved by simply dividing the total expense ratio (including LIBOR) by 2. I believe that this value is more useful when one is trying to compare the expense ratio of the 2x ETNs versus unleveraged funds. In fact, with some of the adjusted TERs being lower than the expense ratios for unleveraged 1x funds, it might be able to juice your portfolio by up to nearly 1% a year by synthetically replicating a 1x position (as described in Build Your Own Leveraged ETF (ETRACS Edition)). The following chart shows the baseline expense ratio (excluding LIBOR) and the adjusted TER of the funds, arranged from lowest to highest. MLPZ has the highest expense ratio (excluding LIBOR) of 1.95%, and its adjusted TER comes out to 2.28%. SDYL has the lowest expense ratio (excluding LIBOR) of 0.70%, and its adjusted TER comes out to 1.66%. With a 11 bps decline this month, the 3-month LIBOR rate has now fallen for three months in a row, giving some respite to 2x ETN expense ratios. The rate is now lowest since November of 2018. I also calculated the position of the stock price of each 2x ETN as a function of their 52-week trading range which is a metric I have found to be quite useful when making buy or sell decisions. As a value investor, I am more inclined to buy a stock when its price is close to its 52-week low. Conversely, I am reluctant to buy stocks when their prices are close to their 52-week highs (of course, momentum investors will disagree). In the below chart, 0% on the x-axis indicates the midpoint of the 52-week trading range. The -50% position indicates the 52-week low while +50% indicates the 52-week high. Note that some of these values may be unreliable due to the low liquidity of some of the ETNs. The movement of the funds over the last month has been mixed. 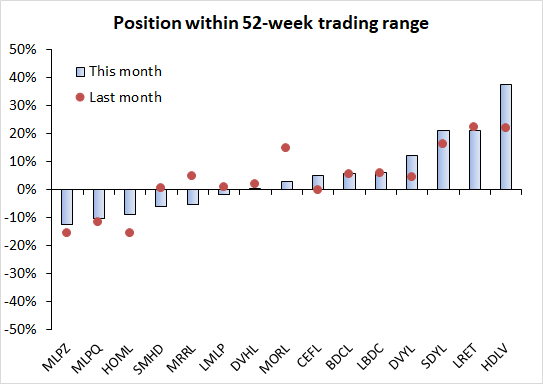 Most funds have moved higher in their 52-week range, but some such as MORL have noticeably fallen. The following chart shows the recent performance of the suite of 2x ETNs, in terms of total return [TR]. 1-year, 3-year and 5-year TR values are given where available, with time periods longer than 1 year being annualized. The figures on the chart show the 1-year total return percentages. We can see from the chart above that there is a large variation between the 1-year TR performances of the 2x ETNs. 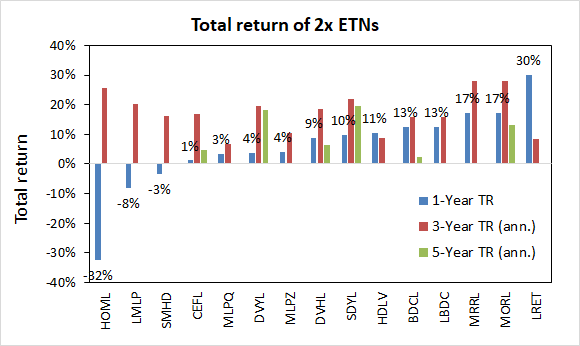 LRET (+30%) and MORL/MRRL (+17%) have the best 1-year returns among the 2x ETNs, while HOML (-32%) is the worst. In October 2015, UBS launched six new "Series B" ETNs, four of which were 2x leveraged (MLPQ, MLPZ, MRRL, LBDC). The main difference between the original "Series A" ETNs and the Series B ETNs is that the former are co-guaranteed by both UBS AG and UBS Switzerland AG, whereas the newer the latter are guaranteed by UBS AG only. In theory, this should make the Series B ETNs less valuable than the Series A, since the former are solely guaranteed by UBS AG. However, it is hard to imagine a scenario where UBS AG goes under and its subsidiary, UBS Switzerland AG (and by extension the Series A notes) remains unscathed. In the same announcement, UBS also stated that they do not intend to issue any new notes in any of its existing Series A ETNs. While this could in theory make those ETNs "broken products," a few simple guidelines could help prevent investors from going astray. First, this "does not affect the terms of the outstanding Series A ETRACS ETNs... including the right of noteholders to require UBS AG to redeem their notes on the terms," meaning that if the ETNs were to deviate significantly below their NAV, large players could buy the notes on the open market and have UBS redeem them (the minimum number of shares for redemption is 50,000) at their NAV. This arbitrage potential should act as a driving force to push the price of the ETN back up towards its NAV. On the other hand, if the notes were to deviate significantly above their NAV (say >10%), then... what are you waiting for? Sell the notes right now on the open market and buy them back later when the price falls back to its NAV. This also serves to remind that one should always check the indicative value of the ETNs on the UBS ETRACS website before buying any fund. To my knowledge, despite UBS announcing suspension of issuance of new Series A ETN shares, none of the ETNs have ever traded significantly above (>10% ) their NAV for any sustained period time. 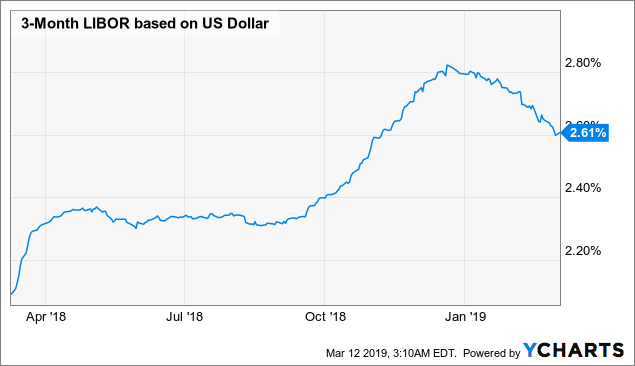 This could be because UBS still has a reservoir of "Previously Issued But Unsold Notes Available for UBS Securities LLC to Sell" for each ETN, allowing supply to match demand until the reservoir becomes fully exhausted. An interesting feature of the ETRACS 2x leveraged ETNs is that their leverage resets monthly rather than daily, which is the norm for most leveraged funds in the market. It is well-known that decay or slippage in leveraged funds will occur when the underlying index is volatile with no net change over a period of time. By resetting monthly rather than daily, the decay of the ETRACS ETNs might be somewhat mitigated. Seeking Alpha author Dane Van Domelen has conducted both theoretical and empirical research into the performance of leveraged funds. His research showed that in most cases, the decay is not as serious as is often initially thought to be. My own research on the live performance of the 2x ETNs showed that monthly resetting has generally helped rather than hurt performance. Moreover, the 2x ETNs charge a finance cost (3-month LIBOR plus a variable financing spread) to maintain their 2x leverage. Due to prevailing low interest rates, the finance charge is currently relatively low, but this could change when/if interest rates rise in the future. Still, the financing rates charged to these ETNs are still much lower than what the majority of retail investors would be able to access from their brokers. This means that from an expense ratio point of view, it would usually be better to buy the leveraged fund than to try and replicate it yourself with a margin loan from your broker. It should be noted that investors in the 2x ETNs are subject to credit risk from the fund sponsor, in this case UBS. If UBS were to go bankrupt, the ETNs will likely become worthless. Professor Lance Brofman has argued that the risk of ETN investors losing money due to UBS going bankrupt is, barring an overnight collapse, minimal because the notes can always be redeemed (the minimum number of shares for redemption is 50,000) at NAV. Moreover, since ETNs are debt instruments, their distributions are considered as coupon payments rather than as dividends. Distributions from ETNs are therefore treated as interest tax-wise and subjected to the ordinary income tax rate. We’re currently offering a limited time only free trial for the CEF/ETF Income Laboratory with a 20% discount for first-time subscribers. Members receive an early look at all public content together with exclusive and actionable commentary on specific funds. We also offer managed closed-end fund (CEF) and exchange-traded fund (ETF) portfolios targeting ~8% yield. Also, check out our 5-star member reviews.